Hiya guys! Another day closer to Polish Pickup and I'm here to add more to your carts. You're welcome, haha. The theme this month is Fandoms and it is going to wreck so many wallets. Including mine... and I can't wait! 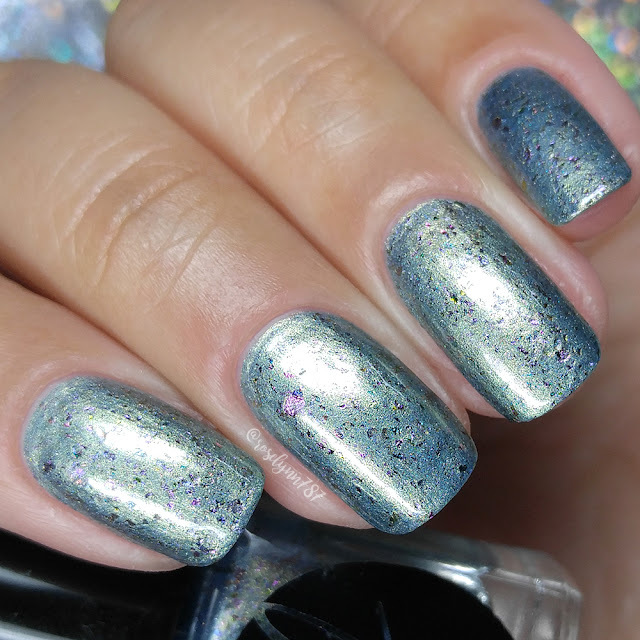 Today I'm sharing swatches for Jior Couture November contribution to the Polish Pickup Collaboration. I've been excited about this theme and this polish in particular because it goes into my childhood. No spoilers yet. not until you read some more. So let's go ahead and get right to the swatches! Proud, Proud Family by Jior Couture will be available for purchase through the Polish Pickup Shop November 3rd at 11AM EST through November 6th. This full-size 12mL shade will retail for $10 each. If you're not familiar with the concept, the Polish Pickup offers a fun, interactive experience that allows you to submit theme ideas, vote for your favorite theme, and selectively purchase your favorite polishes every month. As I mentioned before, the theme that was voted for November was Fandoms! For this month Sacha found inspiration from a favorite cartoon of mine. The Proud Family. 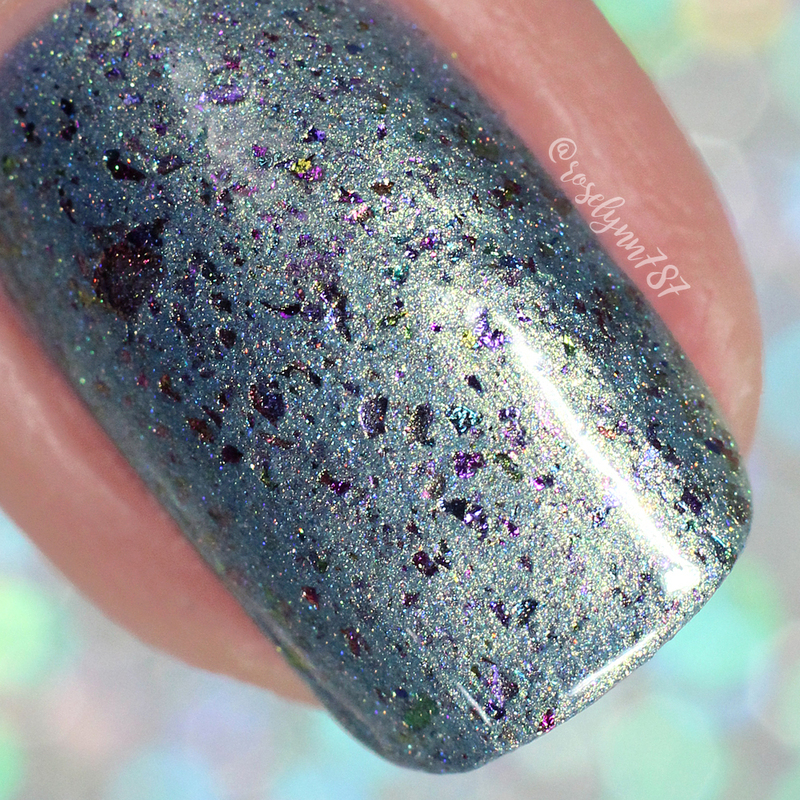 Proud, Proud Family can be described as a blue to gold duochrome base with multichrome flakes. Isn't this a stunner?! Hands down one of my favorites this month. It has a really unique look, especially given the inspiration. Definitely not what I was expecting, but I am loving it all the same. The duochrome finish was tough to capture on film, but the macro I believe show off the finish the best. The formula has a sheer application, but has a smooth easy and even build-up throughout the nail. Consistency wise it's well balanced, not too thick or too thin. It dries down nice and smooth, plus it has a high-shine finish. There are some minimal brush strokes that mostly blend out after topcoat. Shown in three coats and sealed with a glossy topcoat. To recap, Proud, Proud Family by Jior Couture will be available for purchase through the Polish Pickup Shop November 3rd at 11AM EST through November 6th. This full-size 12mL shade will retail for $10 each. Be sure to join the Facebook group Polish Pickup Pack for more details and also check out the other makers involved for the month of November!